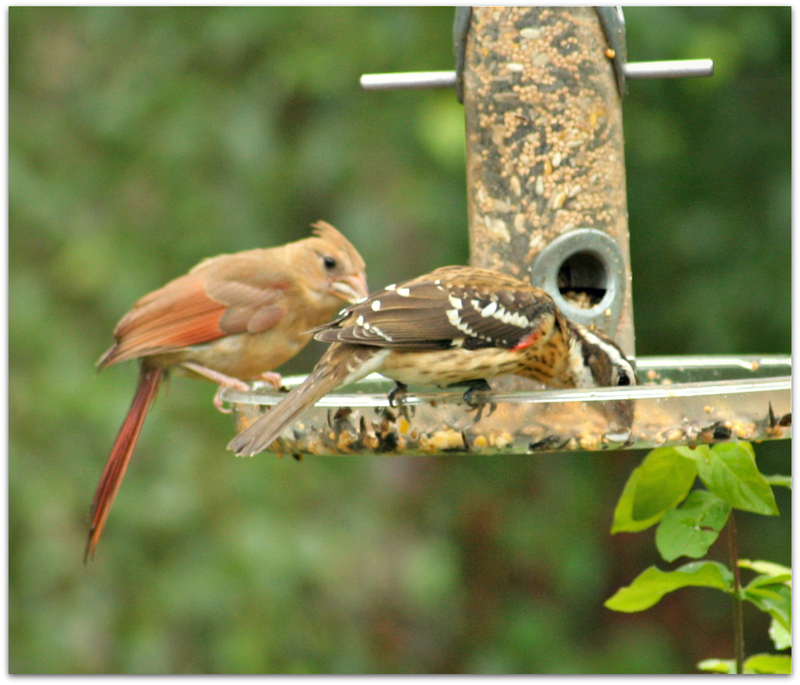 Our male Rose-breasted Grosbeak has been joined by a female. So different looking! And pretty in her own way, with her golden bib. 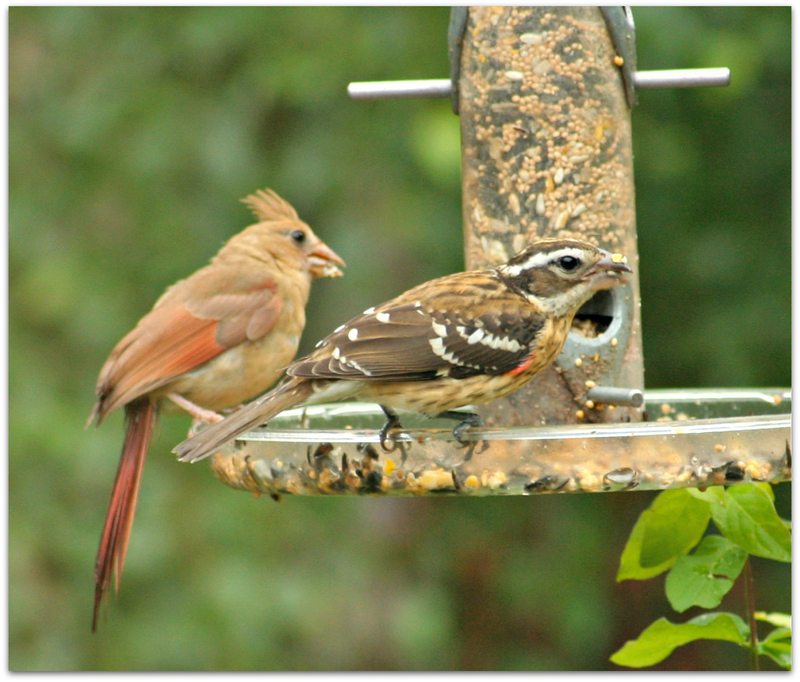 These chunky birds use their stout bills to eat seeds, fruit, and insects. 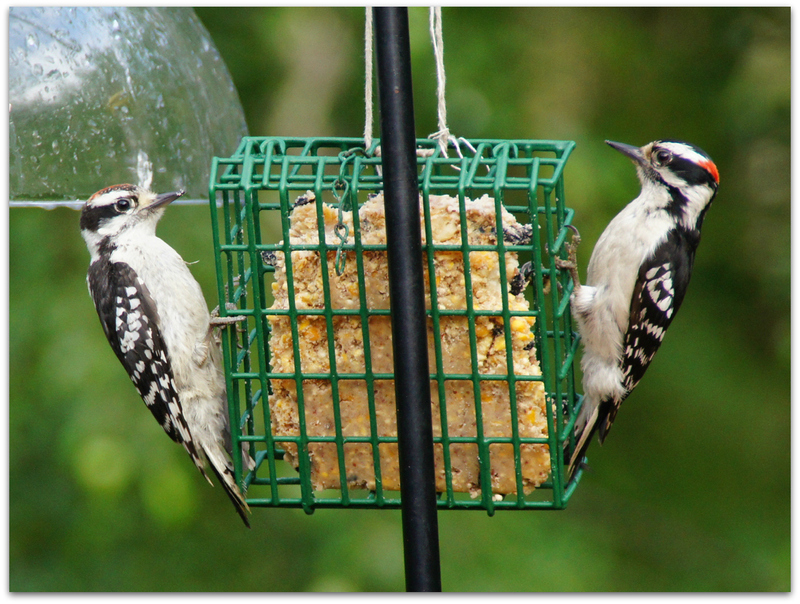 They are also frequent visitors to backyard bird feeders, where they eat sunflower seeds with abandon. 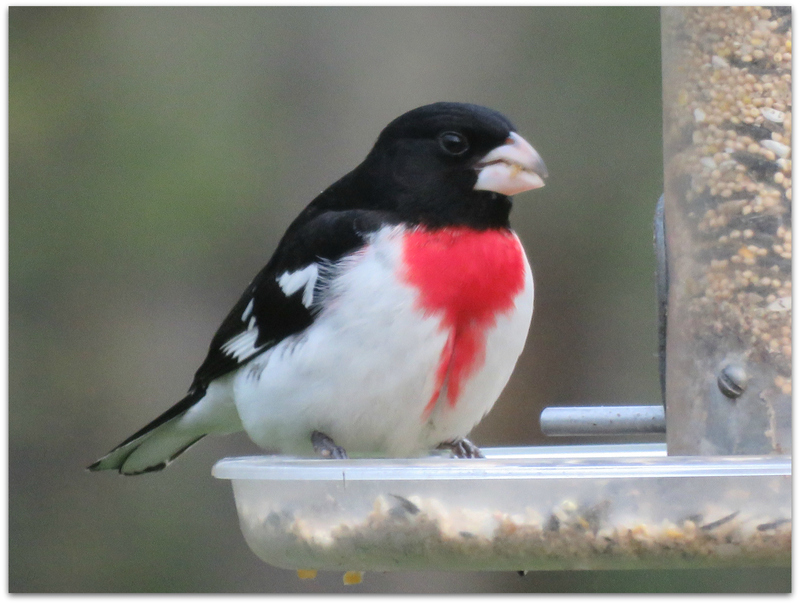 This entry was posted in Uncategorized and tagged backyard birds, birds, Rose-breasted Grosbeak on May 14, 2016 by Amy. First sighting this spring of a Rose-breasted Grosbeak, a male. 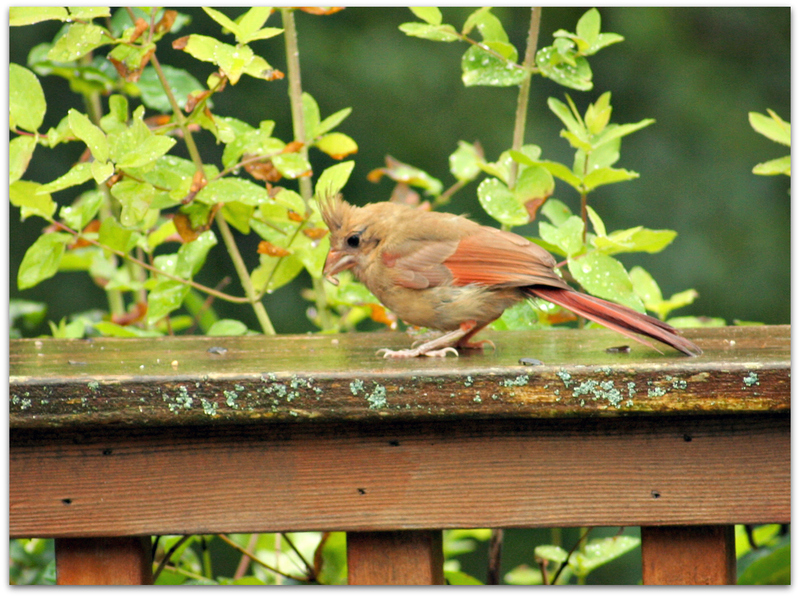 Pretty bird on this gloomy, rainy day. A Baltimore Oriole also visited our hummingbird feeder a couple of hours ago but I couldn’t find my camera quickly enough. 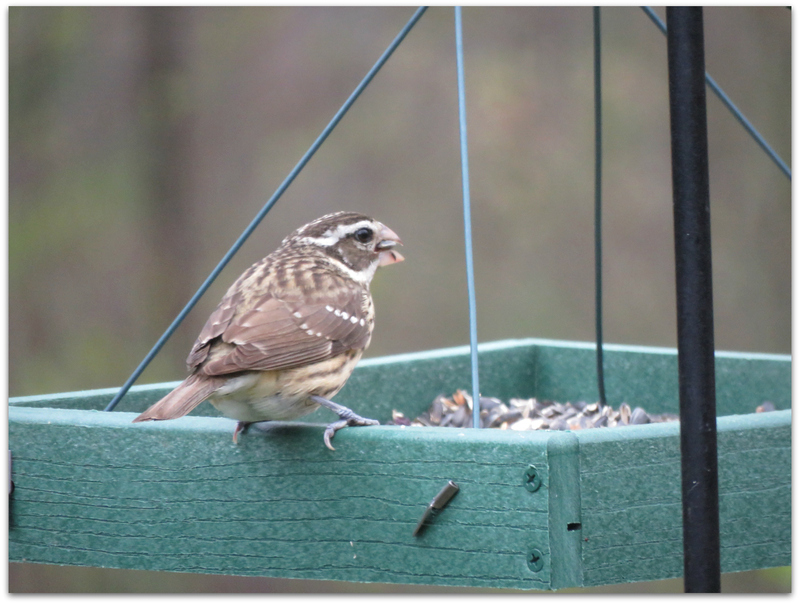 This entry was posted in Uncategorized and tagged backyard birds, birds, Rose-breasted Grosbeak on May 8, 2016 by Amy. 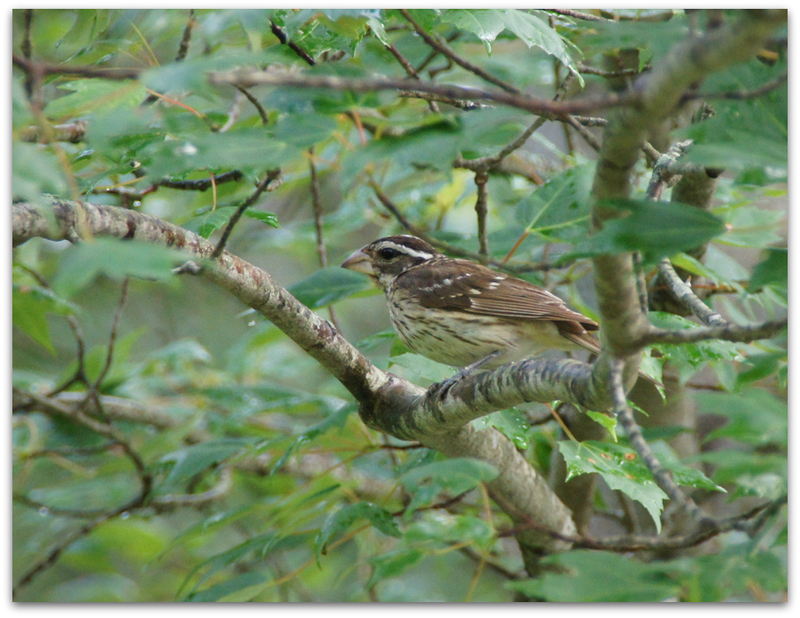 A female Rose-breasted Grosbeak watches us from a maple tree near the back deck and bird feeders. My husband was cooking dinner on the grill – a delicious chicken and sausage paella on the new Kamado Joe, in fact. 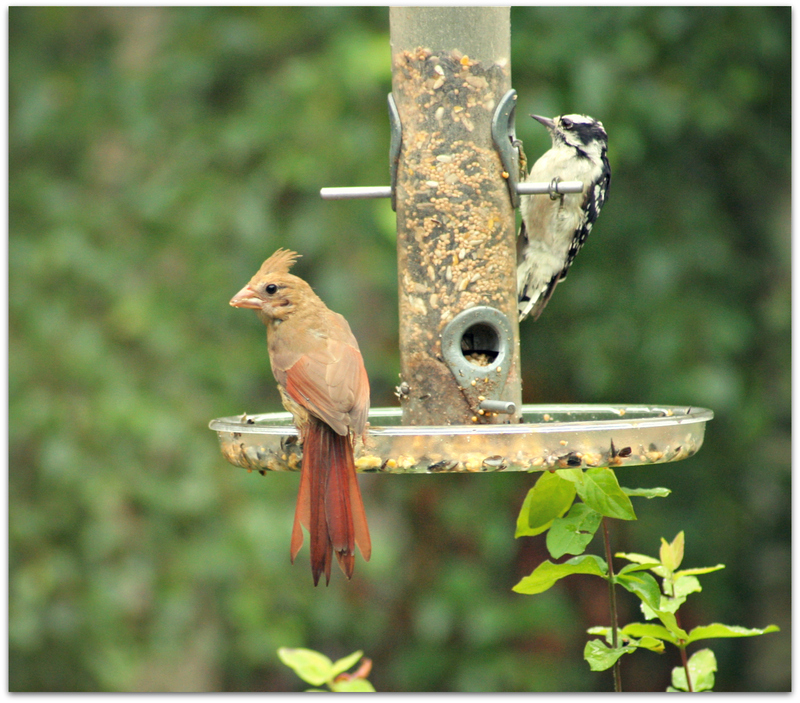 A couple of dauntless downies, males, on either side of a cake of suet. The grosbeak repositioned to the top of the blackberry arbor, but wouldn’t come closer for her dinner until we went inside. 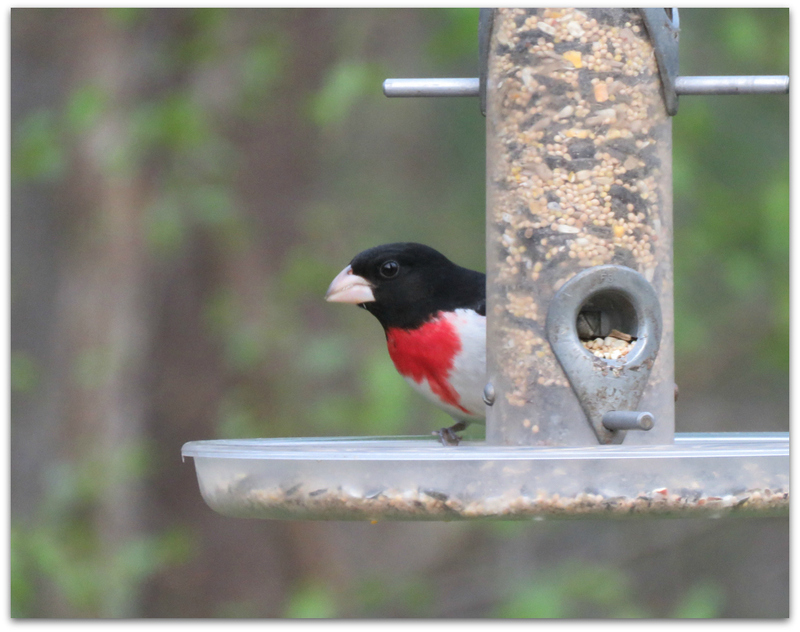 There have been a pair of Rose-breasted Grosbeaks visiting for a few weeks this summer, probably nesting nearby. 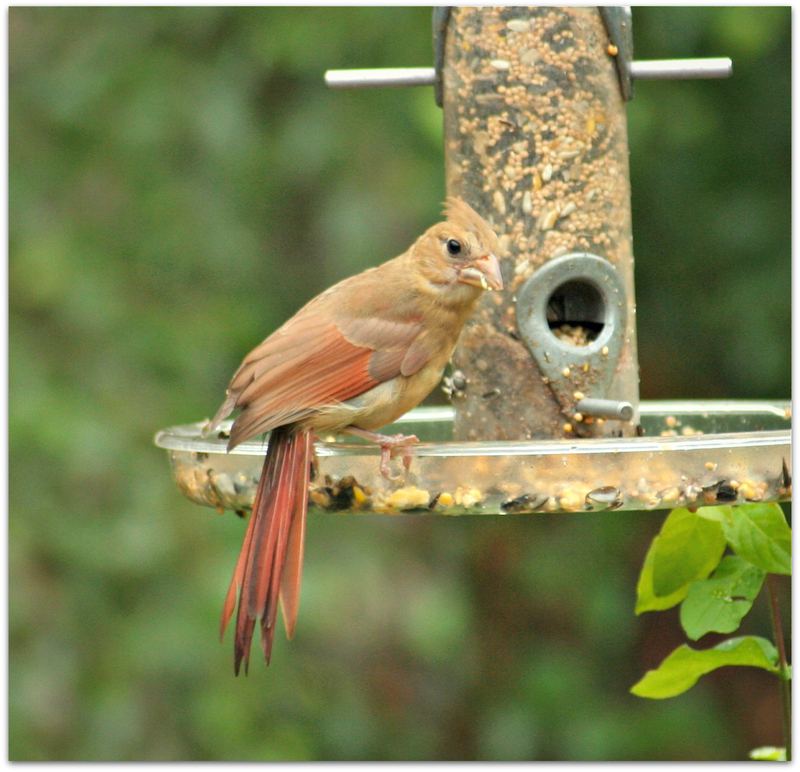 I notice the male at the feeder much more often, but maybe because his flashy red and white chest makes him much more noticeable. 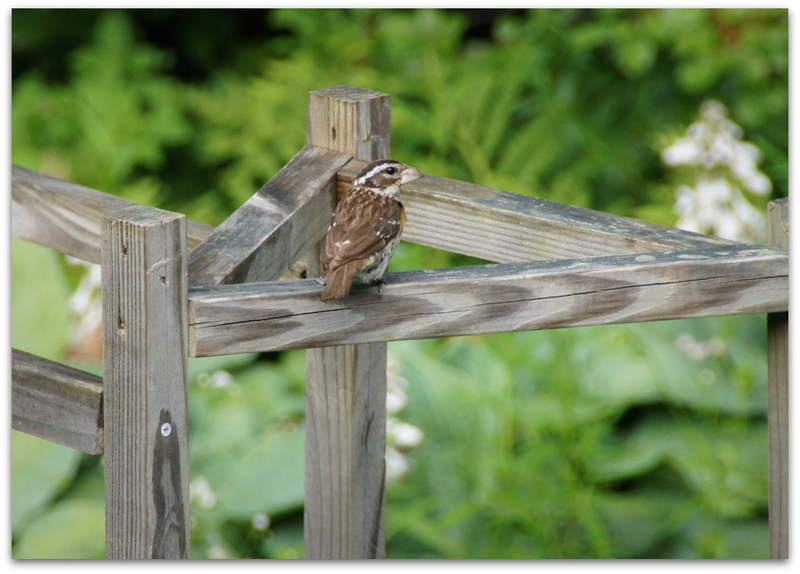 This entry was posted in Uncategorized and tagged Rose-breasted Grosbeak on July 5, 2015 by Amy. Rose-breasted Grosbeak puts in an appearance, yesterday evening around 7 p.m.
Bursting with black, white, and rose-red, male Rose-breasted Grosbeaks are like an exclamation mark at your bird feeder or in your binoculars. 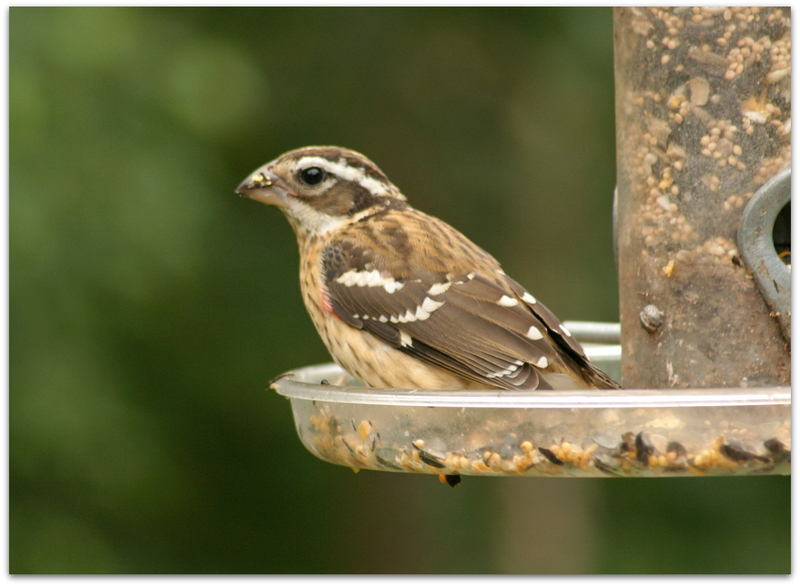 Females and immatures are streaked brown and white with a bold face pattern and enormous bill. And right on cue, just before I blogged the male this morning the female appeared, around 6:45 a.m. Welcome to your summer lands, RBGs! 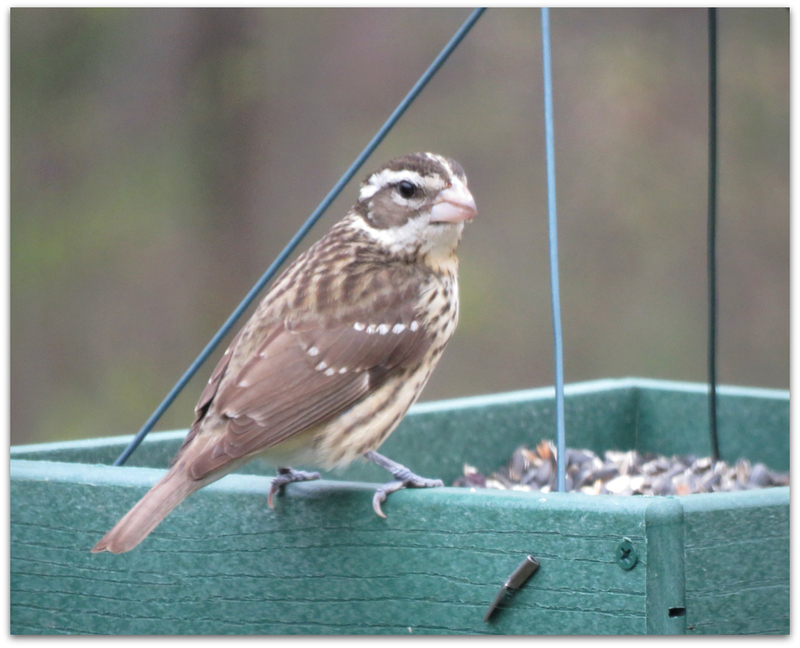 This entry was posted in Uncategorized and tagged birds, Rose-breasted Grosbeak, spring migration on May 9, 2015 by Amy.